Lawson (manufacutured by Kotobukiya) is going to release the Shikinami Asuka Langley ( 式波・アスカ・ラングレ ) Loppi Ver. 1/8 PVC figure from the Neon Genesis Evangelion movie “Evangelion 2.0 You can (not) Advance” ( 新劇場版エヴァンゲリオン「破」 ). Will be released on October 30, 2010. Around 200mm tall, 7,000 yen. Lawson exclusive. This Asuka is so lovely!!! (@@. But too bad she is Lawson exclusive. For those who are interested, you can get her with your proxy serivce at the Lawson Loppi EVA page here. FYI, Lawson (ローソン) is convenience stores like 7-Eleven. I don’t know if they’re only in Japan or they’re international tho. 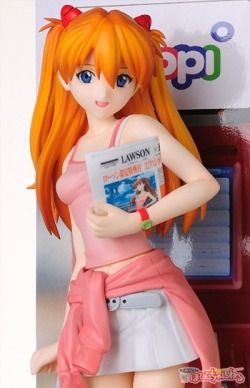 Shikinami Asuka Langley Loppi Ver. 1/8 PVC figure - "Evangelion 2.0 You Cannot Advance"